and all of you—into their home for an up-close-and-personal look at where and how they live, providing real, hands-on ideas and inspiration for better living. 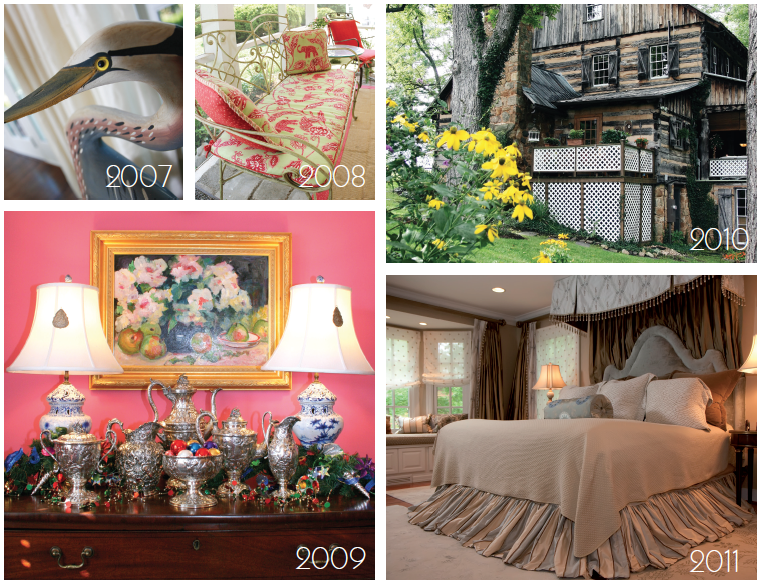 Here, with heartfelt thanks to all participating homeowners over the years, we revisit just a few of the most memorable. 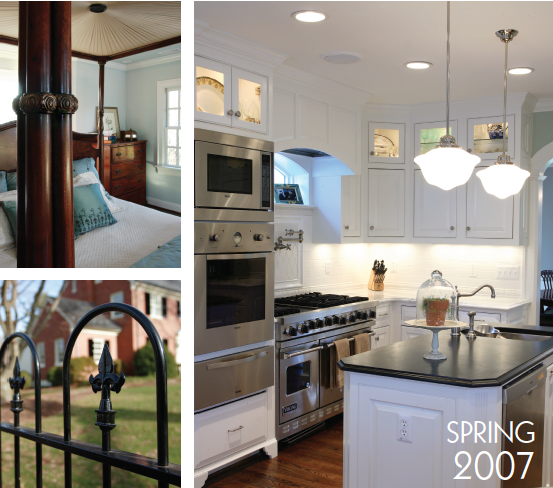 HOME’s inaugural issue in Spring 2007 featured the classic Colonial home of Angela and John Olmstead on Langhorne Road. The couple purchased the home in 2001 and added a two-story addition with the help of Ron Driskill and Scott Elliott of Custom Structures. The addition, featuring a new kitchen and open gathering room downstairs, and a new master suite upstairs, was inspired by Angela’s love of cooking and entertaining. Cool palettes and classic furnishings punctuated with family treasures makes this house a great family home worth sharing. The Olmsteds have enjoyed living in an old home with all the modern-day conveniences. In 2017, they are planning a move and their house will be for sale. Angela is hopeful that another family will be able to enjoy the house as much as they have. issue, showcases the vibrant, fun-loving personalities of those who live inside it. an iron butterfly above the sofa, custom dragonfly embellishments on colorful drapery and dragonflies hand-painted on the kitchen floor—convey the sense of whimsy embraced by the homeowners Caroline and Mike Malott and family. Since publication in 2008, the Malotts have been hard at work on their home, installing a pool and pavilion, adding a new master bath, flipping the living and dining spaces, expanding and renovating the kitchen and mudroom, installing a new bright-red metal roof and….adopting Kunekune pigs and a barn for them! 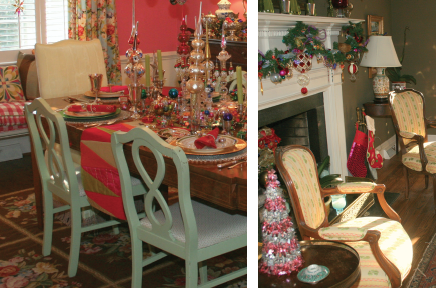 A lover of antiques and a collector at heart, Carter Bendall transforms the family’s charming cottage off VES Road into a colorful Christmas showcase each year—which includes up to 20 fabulously bedecked trees. 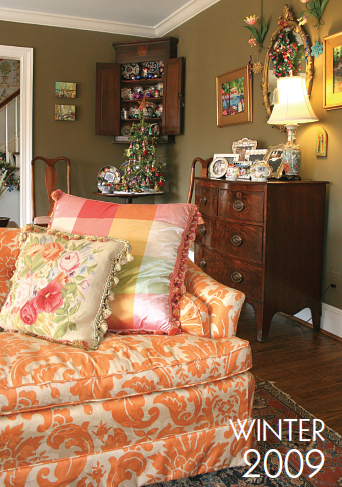 Our winter 2009 issue showcased this home that she and husband Richard bought and renovated as young newlyweds; the home is full of vibrant color, fine furnishings and meaningful collections. Carter notes that the Bendall family has not only moved locally, but has also expanded; they now have a five-year-old daughter, with whom they enjoy carrying on these holiday traditions. 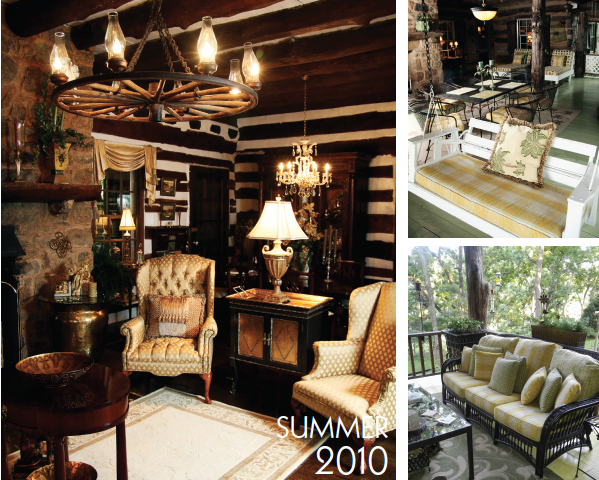 Debra McCabe’s century-old cabin on the historic Ivy Hill estate in Forest, featured in our Summer 2010 issue, is a study in contrast; it’s a showcase for her chic style (also found at her boutique, The Columns) in the rustic backdrop of log-and-plaster walls. This style is captured in the great room which boasts elegant furnishings, a stone fireplace and a wagon wheel chandelier. Her exteriors delight as well; a secret porch off her kitchen is a favorite personal spot and the expansive back porch, complete with fireplace, bar, grill, a porch swing and comfy couches, is ideal for entertaining and relaxing with friends. Linda Duerson realized her family needed more space, but her daughters didn’t want to leave their beloved, traditional home, so she did what homeowners who can’t bear to move do: they added on. 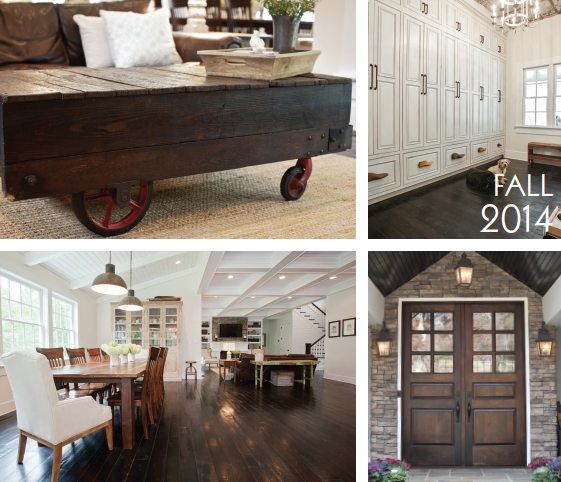 Featured in our Spring 2011 issue, the renovations include a new expansive kitchen and great room perfect for gathering and entertaining, a family-friendly and well-appointed mudroom, and a first-floor master suite. Stunning exteriors feature a multi-level, hardscaped paradise created by Land Tech, complete with pool, poolhouse, outdoor kitchen and extensive landscaping and gardens. The Duerson home was also featured on the Historic Garden Day tour in 2011. 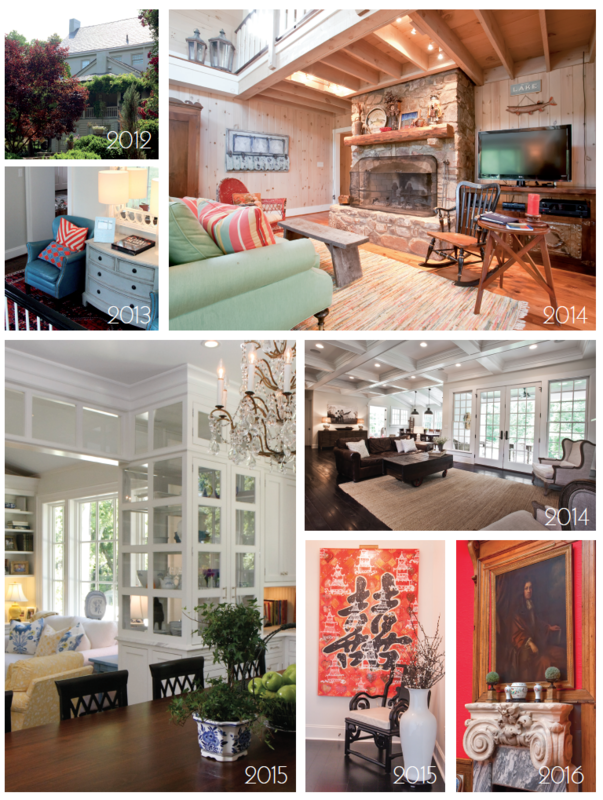 Martha Anne and Statham Gilliam uncovered a hidden gem when they purchased their Oakwood Place home in 1999, featured in our Fall 2012 issue. Though it needed work, the home had great bones and charming details—heart pine flooring, floor-to-ceiling windows, interior shutters, deep windowsills and wrought-iron balconies—that make it the elegant yet comfortable home that it is today. 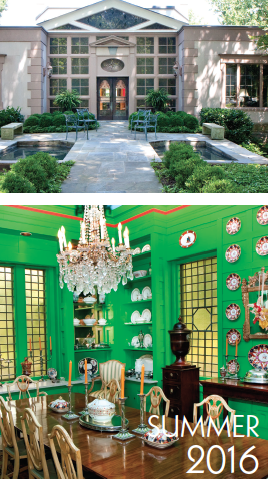 Perhaps the most amazing aspect of their renovations was uncovering a “secret garden” whose design is attributed to early-20th-century landscape architect Charles Gillette. 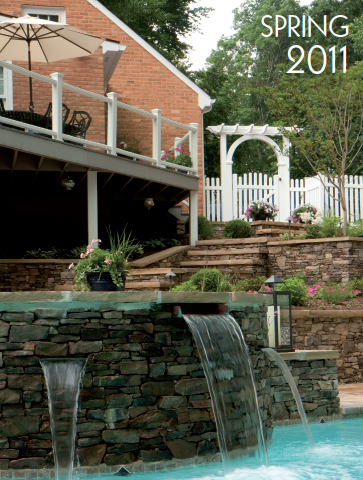 Over seven years with thousands of man hours, the garden was lovingly restored into a backyard paradise, with multiple garden rooms and water features. Alex and Sackett Wood chose their home off Link Road, featured in our Fall 2013 issue, for its proximity to grandparents as well as the family-friendly neighborhood vibe. Over time, they renovated the Federal-style Colonial to better suit their bustling family life with three boys, enlisting Justis Construction to create a cook’s kitchen with double ovens, stainless appliances and a generous island with family-friendly seating. The couple also added a first-floor master suite, family room and screened porch that runs the length of the home. Alex designed much of the interiors, using her natural flair for design that was mentored and supported by Sackett’s cousin, Laura Sackett of The Arched Doorway. 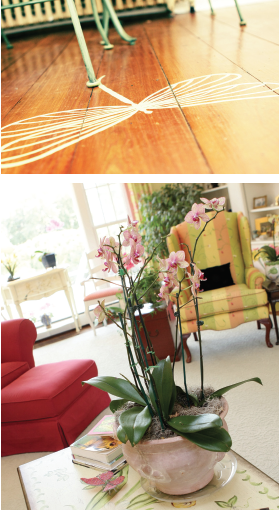 Family photographs and artwork by Virginia artists are an important part of the home’s decor. What if every day could feel like summer camp? 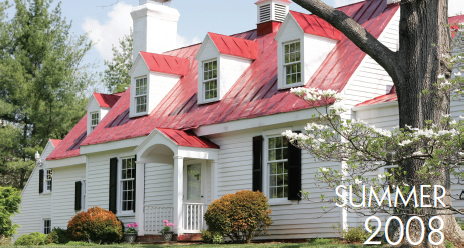 That’s the focus of the Bingham family’s Smith Mountain Lake vacation home, featured in our Summer 2014 issue. Built by Robert Kulp of Blue Ridge Residential and Black Dog Salvage in Roanoke, the custom home is designed to look like an old lake house that had been around for awhile. It features a variety of open and private interior spaces, abundant views and extensive outdoor space. A mix of modern amenities and salvaged materials and artifacts keeps the vibe fun and fresh, while a palette of blues and corals makes the home feel vibrant and bright. Twenty guests can sleep here comfortably in a variety of places—including a sleeping porch outfitted with hanging swing beds. 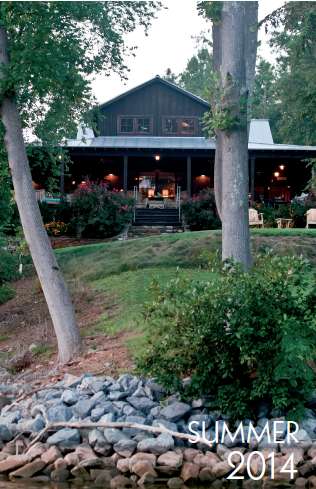 Joe and Jessica Hodges have created their forever home on 75 of the 600 acres of their family farm in Evington. Featured in our Fall 2014 issue, the Hodges’ charming country farmhouse was built by Zach Baldridge of True Custom, Inc. Of note are the double front doors, reclaimed from the old Evington Schoolhouse—doors Joe’s grandmother walked through when she was a young student. The central living area is uncluttered and airy with coffered ceilings, neutral walls and dark-stained hardwood floors. Jessica says that she loves things that are “simple, beautiful and orderly”—and every area of the home reflects this aesthetic. A large kitchen, generous pantry, an organized and hardworking mudroom, charming bedrooms and space to entertain friends make this the perfect family home. 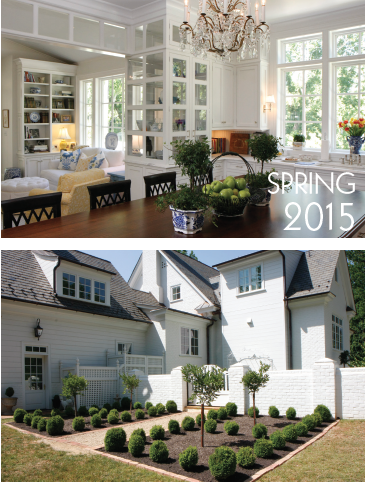 Michelle Bell’s custom home, featured in Spring 2015, was a labor of love for all involved. Several years after losing her husband Dr. John Howard Bell in a tragic accident, she sold their home on 29 acres in Boonsboro, carving out six of those acres for a new custom home for herself—one more appropriate for her lifestyle. 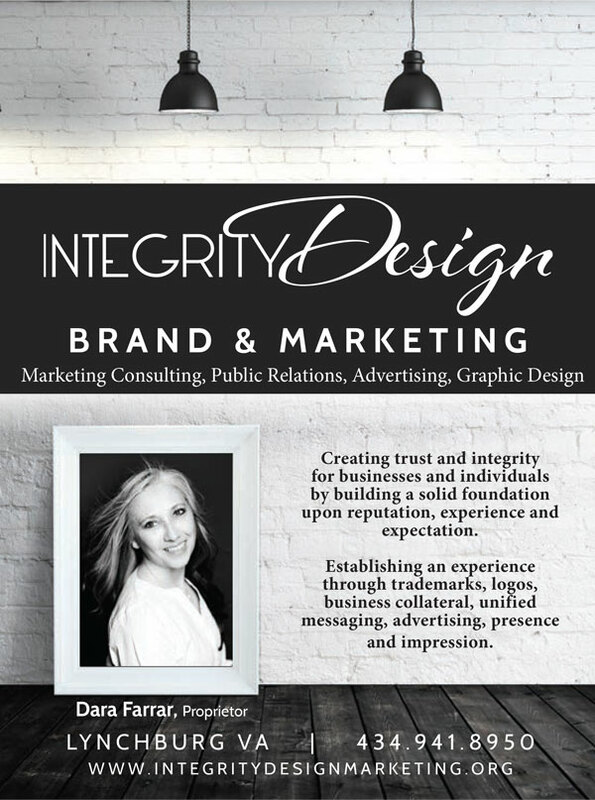 Because of the great experience working with Wingfield-Burton Construction for her previous home, she enlisted them again. The result is a home that’s “Virginia Country”—classic white bricks, slate roof, stately black shutters, symmetrical chimneys. Laura Sackett of The Arched Door helped Michelle design interiors that are traditionally elegant yet relaxed. Highlights include a large creamy-white kitchen and light-filled sitting room with cheerful and serene furnishings in whites, blues and yellows. With grown children and a zest for adventure, Claudia and Mark Stubstadt—both creative people, rooted in the design fields—made a quick decision to downsize when someone offered to buy their traditional family home. 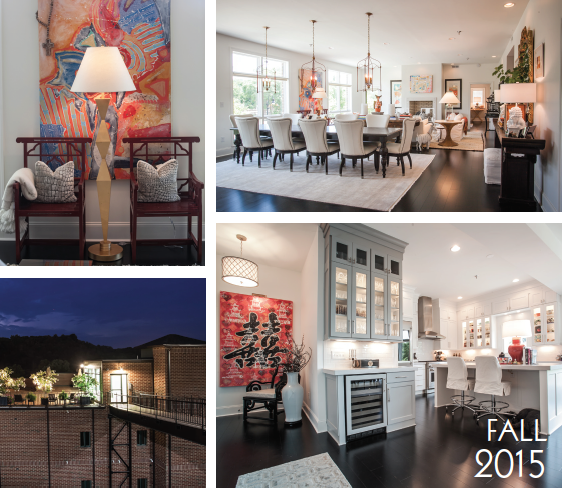 With three weeks to move out, they kept only the things they truly loved, and happily purchased a three-bedroom condo in James River Place, featured in our Fall 2015 issue. Their home features an open floor plan, with a sleek kitchen and bar at one end of the expansive entertaining space and comfortable seating at the other. Eclectic furnishings and art collections, most of which is of Claudia’s own creation, make their home a true showcase of their lifestyle—creative, enthusiastic world travelers who also enjoy the comforts of home. 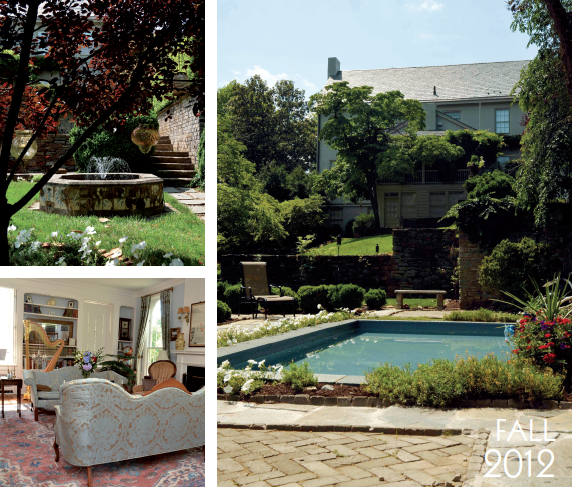 Geri and Lamar Cecil’s home on Mountain Laurel Drive, featured in our Summer 2016 issue, is a reflection of the couple that resides there: fascinating and colorful. Built around an octagonal central room, the home features Palladian-influenced architectural details, marble floors and salvaged antique woodwork. 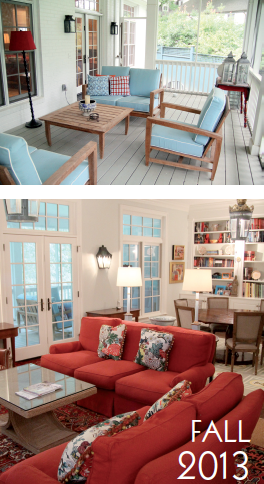 With the help of contractor Tim Reynolds, the couple made some structural adjustments, including adding a sunroom/library (home to frequent bridge games), adding one new bathroom and renovating another, enclosing two porches, and reconfiguring the kitchen and pantry area. With a bold green dining room and a rich red great room, the home is a lively setting for entertaining friends and family as well as showcasing the couple’s extensive collections. A spectacular outdoor space includes a bluestone terrace and marble pool.